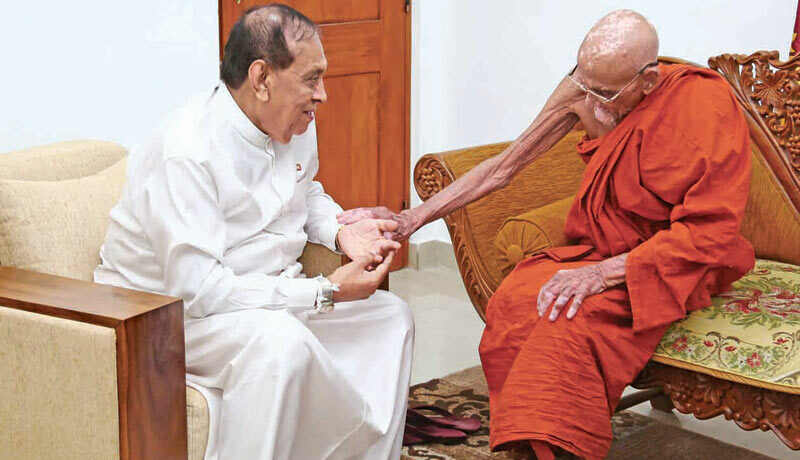 Speaker Karu Jayasuriya called on the Mahanayake of Rammanya Maha Nikaya, Most Ven. Napane Pemasiri Thera, while in Kandy. Speaker Karu Jayasuriya succeeded in establishing democracy and the rule of law amidst a tumultuous situation in Parliament, overcoming difficulties and challenges,” said Anunayake Thera of the Asgiri Chapter, Most Ven. Anamaduwe Dhammadassi Thera. The Anunayake Thera was speaking at a ceremony to felicitate Speaker Jayasuriya with the honorary title of Sasana Keerthi Sri Deshabimani by the Malwatte Chapter at the Mawatte Viharaya in Kandy, on Tuesday. “Speaker Jayasuriya who was born in Meerigama, is an enthusiastic and exemplary leader who had a close relationship with the Senanayake family. He had his education at Ananda College, Colombo, and joined the Sri Lanka Light Infantry (SLLI),” he said. “The Prime Minister said the Members of Parliament were behaving childishly during the recent political crisis. Karu Jayasuriya was intelligent enough to handle the situation wisely. I wish him all the success in his career,” the Anunayake Thera said. The Mahanayake of Kotte Kalyani Samagri Dhamma Maha Sangha Sabha, Most Ven Ittepane Dharmalankara Thera also added that Karu Jayasuriya who was capable of handling the tumultuous situation in Parliament is a clean politician. Most Ven. Diwiyagaha Yassasi Thera delivered an anusasana. Ministers Gamini Jayawickrama Perera and Navin Dissanayake, and Diyawadana Nilame Pradeep Nilanga Dela were also present.